The Sacraments are vital to our lives as Roman Catholics. We celebrate the Sacraments in community, whether as milestones or as everyday gifts, In joyful times and in sorrowful times we join together to support one another and to receive the blessings of God. We invite parishioners wishing to celebrate the Baptism of their infants to make arrangements for a one hour preparatory session. During this session, parents will review the meaning of the sacrament and arrange a time for the ceremony. Sessions are usually held once every month. Baptisms are usually celebrated after the 11am Sunday Mass. To register for a session, please call the parish office. We invite adults who wish to be baptized, and adults baptized in another Christian tradition to participate in the Rite of Christian Initiation of Adults. For information, contact the Cathedraloffice, 503-228-4397. Preparation for these sacraments spans two years, beginning in First Grade. 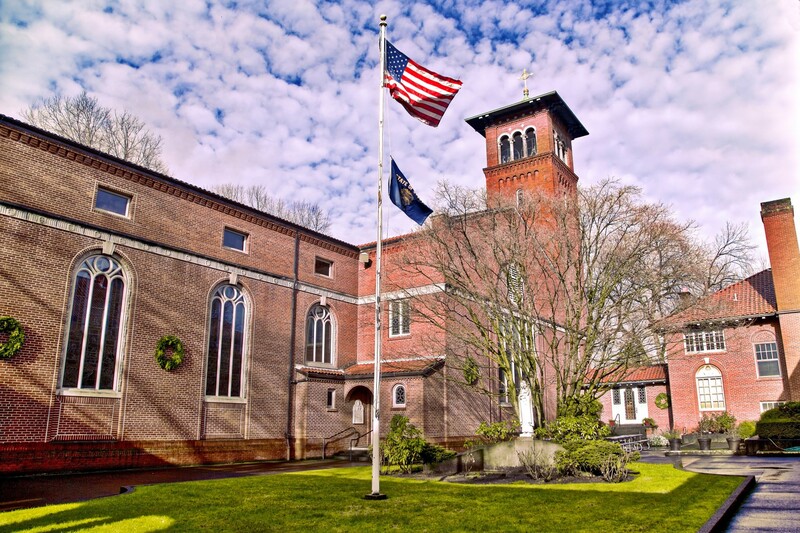 Children may be prepared in their Second Grade class at Cathedral School, or in the Sunday School of Religion, which meets from 10:15 am until 11:00 am in the school. Parents, who must be parishioners, also attend two evening sessions; we encourage parents to take an active part in the preparation of their children. First Reconciliation is celebrated at a special service during Lent. First Communion is celebrated at the 9 am Mass on the first Sunday of May. Confirmation is celebrated every other year in the parish. We invite high school students to prepare for the sacrament by attending, and participating in, sessions which extend through the winter into the spring. Students must attend every session in order to be confirmed. Adults prepare for Confirmation through an evening program. Details of these programs are announced in the bulletin. The sacrament is available every Saturday afternoon from 4 until 5:15 pm. A private confession may be arranged by appointment at any time. During Advent and Lent, the parish celebrates an evening Reconciliation service, consisting of readings from Scripture, a homily, and an opportunity for private confessions. The date and time of the service is announced in the bulletin. The schedule of Mass times is listed above, and also on the back cover of the brochure. If you wish to arrange Communion for a homebound parishioner, including a sick relative or friend, please contact the parish office. Please call the parish office, or check the parish website, to obtain information regarding policies and procedures for the celebration of Matrimony. Marriages should be scheduled at least six months in advance of the wedding date. Although this sacrament is administered to those in danger of death, it is also a wonderful sacrament for other occasions. Many people request the sacrament before surgery. The elderly, the sick, or anyone in recovery may also request the anointing. Please call the parish office any time you wish to request the sacrament. Please contact the parish office when someone is near death, or when there has been a death in the family. We give families our highest priority at the time of a death and consider it an honor to serve you.